7Tees Event at Buchanan Golf Club Hits a Hole in One! They were blessed with a lovely day of sunshine- perfect for golf and the course at Buchanan, which was looking particularly stunning on the day. 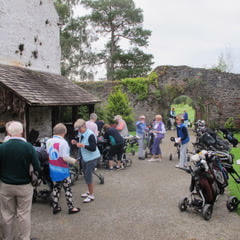 Great fun was had all round as the ladies and their guests enjoyed a shotgun start and a gorgeous lunch. Ali, was the hostess with the most-ess as she dispensed fresh baked goodies from her golf buggy to all players whilst out on the course. Thanks again ladies for all your hard work and support!